Our products are manufactured with 100% organic soil building ingredients from all over the world, and specially sourced from our local bio region, the Pacific Northwest. 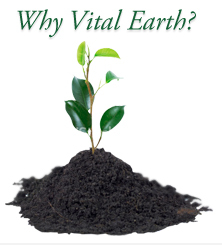 Vital Earth’s® products are formulated with no fillers for maximum performance, and outstanding results. Vital Earth’s® products promote sustainable agriculture practices, and by not using chemicals, a reduced carbon foot print. Vital Earth’s® soil building products are safe non-toxic materials for you and your family to enjoy. These days everyone’s going green. It’s good for you, good for your children, good for the planet. Vital Earth’s® commitment to organic soils and fertilizers has always been rock solid from day one, and we’re glad to see everyone else finally jumping on the bandwagon. We believe that together, we can make a positive environmental impact that will transform the way we think about our relationship with plants and the life-giving soil they thrive in. The healthier the soil, the healthier the plants, the healthier you and your loved ones are and will continue to be. Not only do we provide you with the best quality products, we also provide step-by-step instructions for how to get the most from your organic garden, developed through years of careful trial and error in our own gardens. Vital Earth’s® products are used by home gardeners and farmers looking for an eco-friendly way to improve crop production, soil health, and nutrient uptake without the use of harsh chemical fertilizers, and to promote a sustainable approach to agriculture. We care about protecting our environment and healthy living.